In the aftermath of Stephen Strange’s demise, God Doom feigns as much sorrow as he can possibly muster, pinning the blame squarely on the refugees from Earth 616 and sending his ‘daughter’ Valeria Richards and her team to track them down. Valeria is pretty sharp though, and so is her team, and between them they quickly realise that something is slightly off. Love how Hickman is sculpting this story, every issue for the past few I’ve felt like I’ve gotten as much info as I need about Battleworld and what’s going on, and every issue we get a little more, slowly shaping the history and the rise (and inevitable fall) of Doom. I don’t want to be overselling it, but read this. 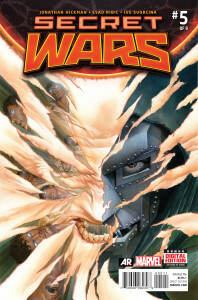 One of, if not the best Marvel event I’ve read in single issue format, even if some of the tie ins are only VERY loosely connected or a bit sub par in quality.